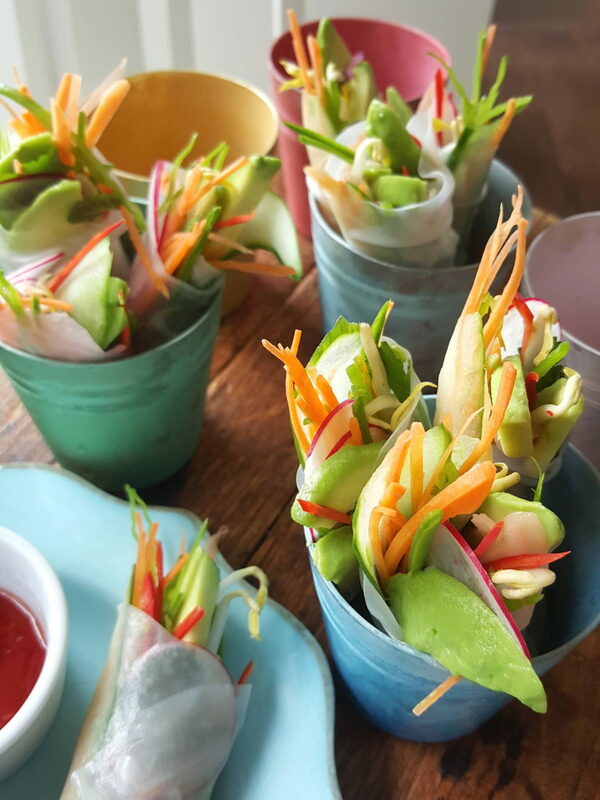 Rice paper rolls with crisp vegetables – spring fresh! You could include smoked salmon, hot-smoked or cold-smoked in these rolls if you like, but I prefer them nice and fresh without the addition of salmon. 1 Prepare all the filling ingredients. 2 Have a saucepan of just-boiled water at the ready. Dip rice paper wrappers one at a time in a water for about 10 seconds to soften. Transfer to a wet board or surface, put on a selection of ingredients and roll up, folding over one end of the wrapper to keep the filling in. The board must be kept wet or the rice paper wrappers will stick to the surface and be difficult to work with. If you can work speedily, you can do two wrappers at a time. If you find it difficult to do, make parcels instead, with the filling enclosed. 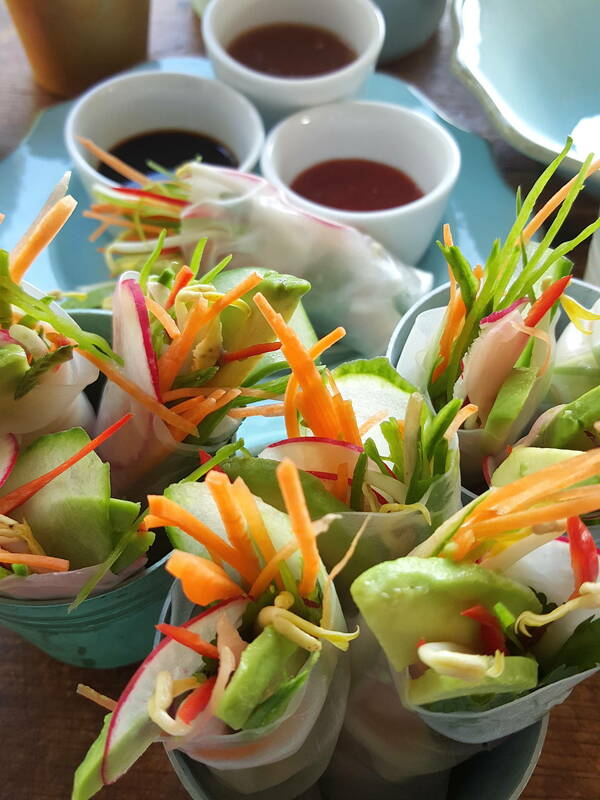 3 Put rice paper rolls on a plate or in a container lined with a double thickness of paper towels previously run under the cold tap and gently squeezed. Drape with another two pieces of damp paper towels, then cover with plastic wrap or a lid and refrigerate for up to 4 hours. 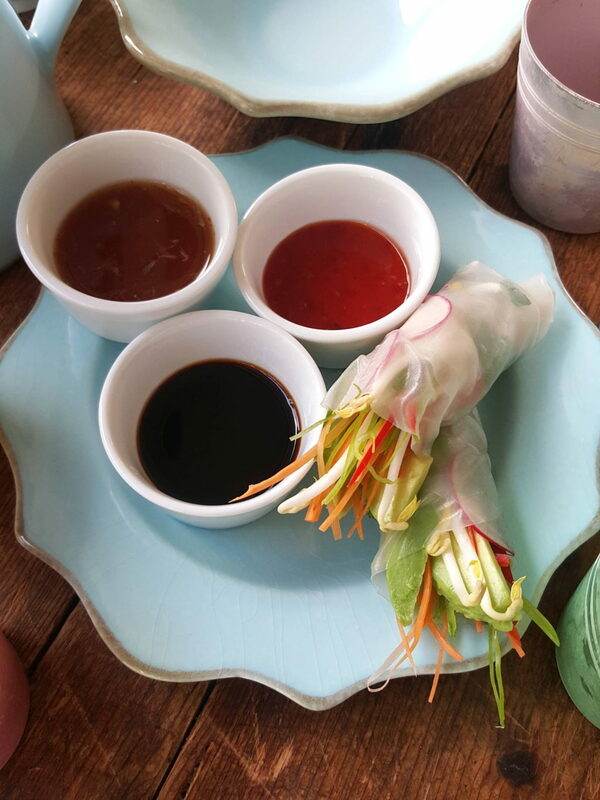 Transfer rice paper rolls to a wet serving plate and serve immediately with dipping sauce or soy sauce. Dip, dunk, swish, all of that ... perfect little dip for crisp vegetables and seafood.